Vaastushastra (Vaastu) is the ancient India science of Architecture based on principles of directional alignment for harmonious living. This app uses the concepts of Vaastu to help the users in achieving an optimal property floorplan and furniture placement. The VaastuShastra app can be used in evaluation mode to evaluate the existing floor plan and furniture layout according to the principles of Vaastu. In this mode the existing direction of rooms and furniture items are recorded automatically using the magnetometer. On doing the evaluation a cumulative evaluation score is provided along with recommendation for each room and furniture item. In case of a Vaastu Defect which cannot be corrected by moving the furniture or changing the floor plan and remedy is also provided. The VaastuShastra app can be used in suggestion mode before creating a floorplan for the property or placing furniture in the room. The rooms or furniture items are placed on the Vaastu Octagon which reorients itself when the users change their orientation. 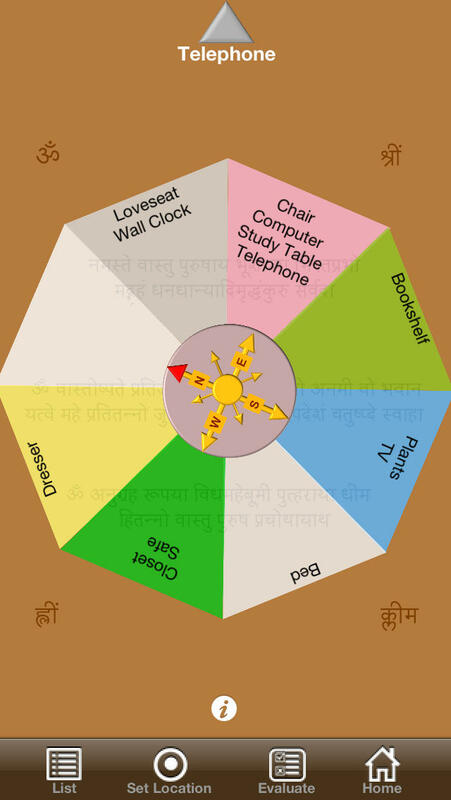 Due to this reason the Vaastu octagon always shows the rooms and furniture items in directions recommended by Vaastu. Vaastu octagon can also be used after evaluation to see the suggestion property floorplan or furniture layout.